This property offers an opportunity to secure a high exposure location on Franklin Ave in the Downtown Fort McMurry Business District. Retail/flex office space with front 10’ Grade loading door, 2 front and one rear man doors. The Space has a 2 piece bathroom and awaits your development ideas. Ample shared customer parking. Rate includes Op costs. Utilities separate. More Fort McMurray Listings Browse through every listing in the MLS® System and do as many different searches as you like! Disclaimer: The data included in this display is deemed to be reliable, but is not guaranteed to be accurate by the Ft. McMurray Real Estate Board. 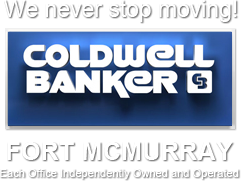 Become a Registered User today and make your search for Fort McMurray real estate more productive and enjoyable.